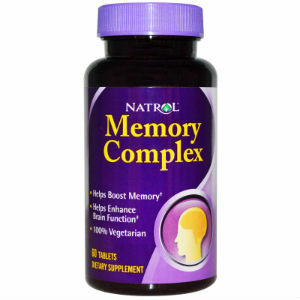 This is a review of the supplement Natrol Memory Complex. This supplement has been devised to boost memory. It also enhances brain cognitive function. In order to gain more information about what is found in the product and our view on it, continue to read on. The ingredients that this product is fashioned from are meant to help increase memory and brain function. Some of these ingredients have very specific functions. Huperzine A maintains mental capacity and gives extra neural support. Ginkgo Biloba Extract enhances memory and stimulates blood circulation in the brain. This product is also appropriate for vegetarian consumption. Two (2) tablets should be taken one time daily alongside a meal. This dosage is the average for such brain supplements; however, the effectiveness is questionable considering that some of the active ingredients seem to be found in low amounts. Side effects are not listed but the product has a warning on it to consult a health care professional prior to using Memory Complex if you suspect or have a medical condition, take prescription medication or are pregnant or lactating. 60 tablets, which provide a supply for about 30 days, can be bought for $16.69. The product may just be excellent value but it is possible that the product will be too weak to have the desired effect, meaning that it would not be good value for money. The manufacturer has not outlined any guarantee on their website, meaning they are not obliged to give a customer a full refund. This could mean that they are not confident about Memory Complex and do not want to have to give out refunds to customers. There is only one review about the product, which is quite short although it offers the product a high rating. Memory Complex has some good points. The manufacturer is GMP certified, which ensures that their products are well made using correct and safe procedures and good quality ingredients. It is also a vegetarian product and a supplement that is quite cheap. However, its exceptionally low price may point to the product lacking in some way, most likely in the amount of ingredients used and their strength. If the active ingredients in the supplement are too low then it will be ineffective. It is further brought down by a lack of guarantee. Not having a guarantee most often suggests that the product is not effective and the manufacturer would be unable to make any money if they had to provide refunds. Lastly, there is no mention by Natrol whether or not children can safely take this product and there is no information on the labels provided by them. While Memory Complex has some positive attributes, they are somewhat overshadowed by the negative ones. Henry Costa	reviewed Natrol Memory Complex	on November 20th	 and gave it a rating of 2.5.